Bayombong, Nueva Vizcaya—OceanaGold (Philippines), Inc. recently bagged various awards during the 11th Annual Global Corporate Socal Responsibility Summit and Awards 2019 in Sarawak, Malaysia. Didipio Mine Officer-In -Charge Glen Duncan (fifth from left) leads other officials of OceanaGold Phils. 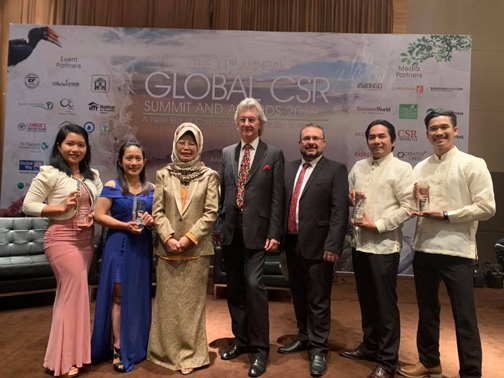 Inc. in receiving the Global Corporate Social Responsibility Awards during the 11th Annual Global Corporate Socal Responsibility Summit and Awards 2019 in Sarawak, Malaysia. The awarding program saw different companies across all industries in the world and recognized the Didipio Mine as Best in Environmental Excellence (Platinum), Empowerment of Women (Platinum), Provision of Literacy and Education (Gold), and Best Workplace Practices (Silver). The awards were received by Glen Duncan, Logistics and Services Manager, accompanied by Bonifacio Labatos Jr., Principal Social Ecology Advisor and Christian Co, Communications Specialist. Marivic Walihon, L&D Specialist, and Tenessee Baguilat, Biodiversity Restoration & Forestry Sr. Supervisor, both from Didipio, also received the awards. The Global CSR Summit and Awards is a vital opportunity to share best practices in Corporate Social Responsibility, enabling corporations to provide sustainable development to communities where they operate. “As we move forward with the transparency, the social media, and the other forms that the media bring, along with reporting mechanisms, it’s essential that organization take the issues of social, environmental, and prosperity side of the equation very seriously,” Global CSR Awards Chairperson Dr. Martin Blake said. Blake is a Director Speaker and Mentor with specialized expertise in board direction and governance. “It is again proven that we from OceanaGold continuously strengthen our partnership with our government and our community creating impacts that go beyond mere business transactions – where we serve an extensive array of human values which cannot be captured by only concentrating on economic value and profit,” Way added. OceanaGold has become a usual recipient of the Environmental Excellence Award, which highlights the Company’s commitment to managing and reducing its environmental footprint through a strong focus on continual improvement in environmental performance, he added. Among the successful environmental programs of OceanaGold is the establishment of Paste Backfill Plant to backfill the underground voids using tailings and cement resulting to the reduction of waste being deposited into the Tailings Storage Facility. The company ensures the maintenance of a rich biodiversity in the areas wherein it operates. It has planted more than 1.6 million trees within and outside the mine site, Way noted. OceanaGold’s women empowerment programs do not only provide the best workplace for women but also transform the mining industry where it was once a workplace dominated by men, he added. By providing literacy and education to communities wherein it operates, OceanaGold was able to empower Didipio and neighboring communities to make decisions on programs geared towards a sustainable future longer than the mine life. “We strive to be the gold-mining company of choice, an Employer of Choice, by investing in our people and providing greater development opportunities, as well as improving management practices,” Way said. Operating a mine in a remote community has tremendously provided opportunities for younger generations in the host and neighboring communities to acquire quality education without leaving their homes, OGPI officials said. They said OGPI has recently built a P43.8-million senior high school building and continuously supports its scholars in finishing tertiary education. The Company also supports capacity-building and training of local to increase their employability not just in the mining industry but also in various economic sectors. OceanaGold’s Didipio Mine received a Special Citation Award for 5 Consecutive Years of CSR Excellence by the world-renowned Global CSR Summit and Awards in 2018 for its continuous implementation of excellent programs for environment enhancement and community development. With this year’s theme “A New Era of Corporate Responsibility and Activism,” the most prestigious CSR summit and awards was attended by almost 300 global delegates from Australia, Dubai, UAE, Taiwan, India, among others.